Weather which ranged from craptastic to middling in no way made 2018’s Seattle Independent Bookstore Day challenge anything less than its usual shiny and glorious adventure! “Failure is not an option” declared my mother during our prep conversations about provisions and timing, and we, I’m happy to say, did not fail. Per tradition, (4 years in a row now), we got to all 19 stores and earned ourselves Champion titles (and 25% off cards) and we found books we were looking for and books that were looking for us. Independent Bookstore Day is nigh! Mom and I have worked out our provisions for our trek to 19 Seattle bookstores on Saturday with the proper mix of protein (for stamina) and sugar (for the party atmosphere). The one thing I haven’t done and can foresee I won’t have time for is making up a list of books I want to get ahead of time so: random browsing and Staff Recommends shelves here I come! April 30th – MARK YOUR CALENDARS! Details TBD but I have been assured by some in-the-know booksellers that it will again be EPIC in Seattle. 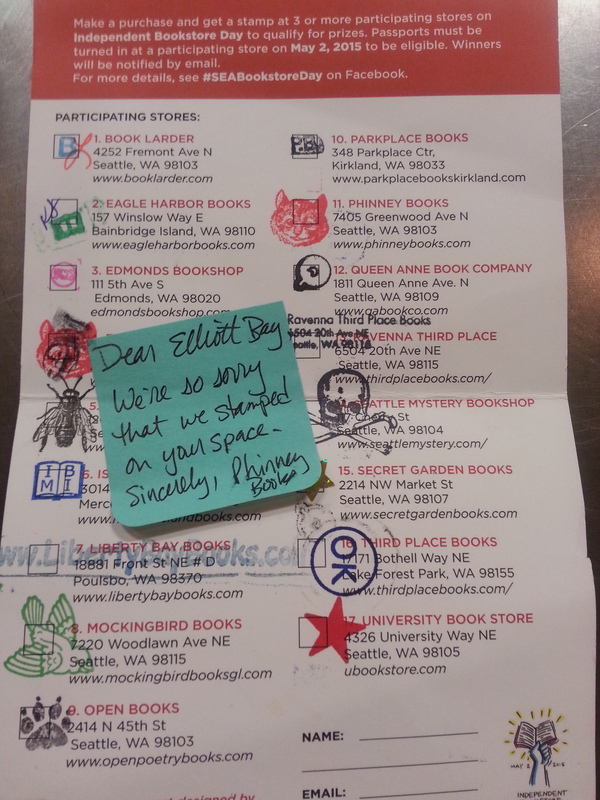 Flashback to last year’s Seattle Independent Bookstore Day adventures, if you need a little reminder of how big Seattle does Independent Bookstore Day! But fret not if you’re outside the Emerald City limits, there ARE a lot of independent bookstores out there. Find yours here. Or, if you’re in Canada and call it Authors for Indies Day, here. The theme for my 2015 is totally clear: Reading. Books, bookstores, book contests, books books books. 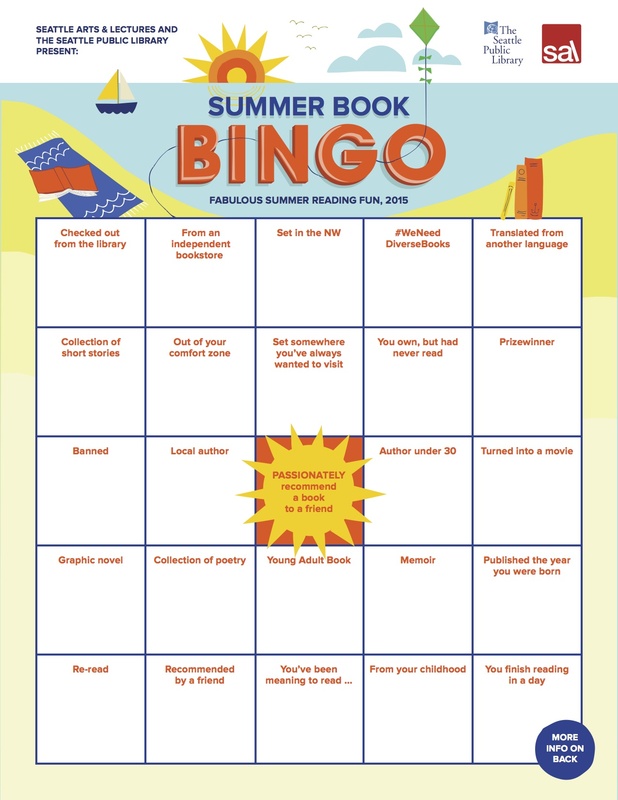 Hot on the heels of the Independent Bookstore Day challenge came Summer Book Bingo, the Seattle Public Library and Seattle Arts & Lectures’ totally awesome summer reading program for adults. Get a Bingo, get entered for a gift certificate from a bookstore. Do a Blackout, get entered for a chance at season tickets to Seattle Arts & Lectures’ next season and books by all the speakers. Deadline: Labor Day. This Saturday, support your local bookstore! Which, in Seattle, means you’ve got a LOT of choices. Of those tons of choices, 17 are participating in Independent Bookstore Day—at the different stores you’ll find various events, discounts, exclusive art, free food, cool readings, kids storytimes, literary madlibs, in-store scavenger hunts, group Exquisite Corpses, wheels of fun and fortune, board game battles, a famous first lines quiz—I mean all that plus BOOKS, can it get any better!